A true myth, a symbol of the Italian dolce vita, a refuge for the international jet-set, Capri has long been a fascination and remains a key stopover for any yacht charter on the Amalfi Coast. With its rugged coastline, fashionable spots, superficial but surprisingly casual atmosphere, Capri is a magical island, a real balcony of sheer beauty opening onto the Mediterranean. Celebrated for its tiny white houses, luxury shops, unique atmosphere and charming Piazzetta, Capri has much to offer to those who charter a yacht on the Amalfi Coast. 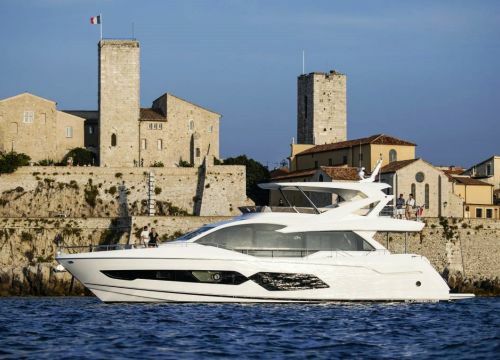 Our yacht charter experts have gathered for you the 10 highlights of the island. Located on the northwestern shore of the island, the Blue Grotto is one of Capri's major attractions. The spectacular sea cave is often overrun by tourist boats but is definitely worth a tour. Long considered a mysterious place haunted by evil spirits, it is only possible to enter it through a small cavity at the water level. Once inside, the magic operates: under a vault about ten meters high, the sea takes on an intense cobalt blue colour. You’ve probably already seen these astonishing rock formations rising from the sea. Approaching the iconic Faraglioni by yacht is totally amazing. Cruising around these huge white rocks will surely be one of your lasting memory from your Capri yacht charter. After this adventure ask your Captain to anchor in the bay so you can enjoy some snorkelling in the crystal-clear waters. Anacapri, the second largest town on the island, contrasts interestingly with bustling Capri - more authentic, more bucolic, less crowded, less glitzy. The small Baroque church of San Michele is a real gem with its tiled-ceramic floor. You can also visit Villa San Michele, built in the 19th century, which is the embodiment of a romantic Italian villa, with its enchanting garden, dreamy pergola and belvedere. Villa San Michele has many remarkable architectural features. You must absolutely look for Medusa's head, a marble bust that was ordered by Emperor Tiberius. 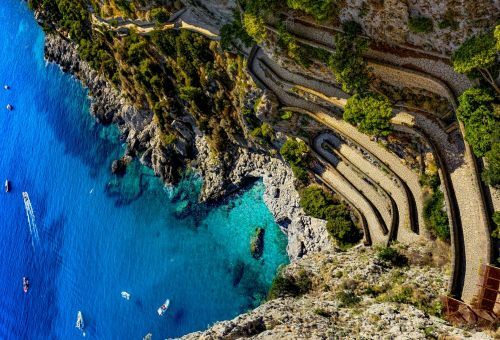 From the villa, you can head back to your yacht at Marina Grande by taking the "Scala Fenicia", a 925-step staircase carved into the mountain. The main square of Capri is better known as the Piazzetta. It’s the place where you feel all the energy and lively atmosphere of Capri. Originally, the Piazzetta was Capri's market square. Despite its modest beginnings, it is now the place where the jet-set comes to sip cappuccinos on small wicker chairs and drink red wine sitting under verandas covered with vines. Whether it's for a coffee in the morning or for the traditional aperitivo in the evening, stopping for drinks on this charming square is a must. We particularly like the terrace of the Gran Caffee. Via Camerelle and Via Sopramonte are the best addresses for shopping in Capri. You will find the boutiques of famous Italian designers such as Prada, Ferragamo or Pucci along with cobblers making Capri leather sandals and bags. Artisan boutiques shamelessly stand side by side with luxury brands. Local shops include Carthusia (they produce perfume with flowers found on the island) and Capri Watch. This trail will bring you to the southeastern part of the island through a spectacular scenery. It takes about 2 hours to walk. On the way, you will be able to see the Arco Naturale, a large natural arch nearly 20 meters high, the Matermania Grotto, Villa Malaparte and the viewpoint of Tragara with its panoramic views over Marina Piccola bay. Another dramatic walk on the island of Capri. Built by the German industrialist Friedrich Krupp, the walk starts at the Carthusian monastery of San Giacomo bordered by the gardens of Augustus, a lovely flowered garden with a few sculptures. The path then winds its way to the sea and you can admire the most famous sweeping view of Capri and its Faraglioni rock stacks. You can then keep walking down to the waterside to join your yacht. 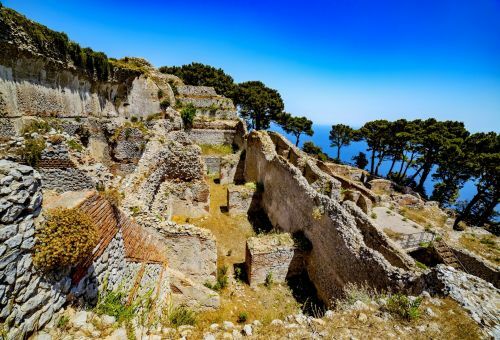 The Roman ruins of Villa Jovis constitute the major archaeological site of Capri. It is believed to be the villa of Emperor Tiberius who lived on the island from 27 to 37 AD. Don't miss Tiberius’ Leap, the promontory from which obtrusive opponents were hurled over the rock bluff by order of Emperor Tiberius. The site offers an interesting insight into the life of the ancient Emperor and boasts superb views across the bay. La Fontelina is one of the most famous beaches on the island. There are not so many beaches in Capri and they are often pretty small and rocky. If you are looking for a place to stop for lunch, head to iconic La Fontelina. The place is ridiculously scenic and we love it! This beach restaurant is an absolute must for your Capri yacht rental! From Anacapri, it is possible to reach Mount Solaro, the highest point in Capri, which peaks at 589 metres above sea level. You can get there by taking a chairlift - the ride takes 12min. From the summit, you can admire a magnificent panorama over the whole island, but also as far as Naples and the Vesuvius. On the way back, you can either walk or use the chairlift. If you land on this page and have not yet booked your yacht charter in Capri, don’t wait any longer. Capri is best explored by boat and a Capri yacht rental is by far THE must-do to discover the island's beauty and the many sea caves. 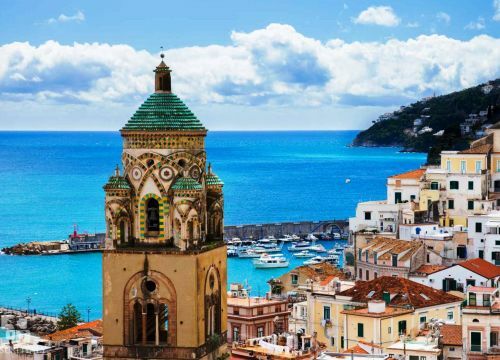 If you charter a yacht for several days, don't miss exploring the Amalfi Coast.